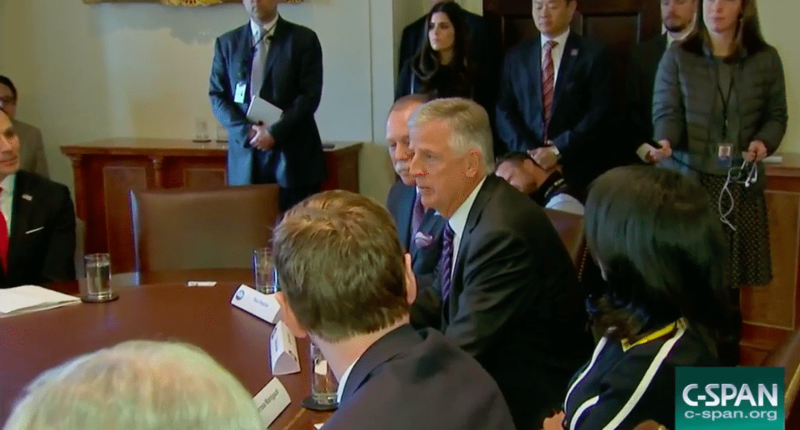 Dennis Nash, CEO of The Kenan Advantage Group, was greeted by President Donald Trump as he and other American Trucking Association (ATA) leaders visited the White House in March. They spoke with President Trump, Vice President Mike Pence and their staffs about health care, regulations, infrastructure and other important issues. The trucking industry executives addressed the need to ease regulatory burdens on the industry, reform the tax system and rebuild America’s infrastructure. ATA leaders indicated that replacing The Affordable Care Act will help trucking employees, their families and their customers by lowering insurance costs, decreasing mandates, liabilities and administrative burdens, and providing access to quality care and patient choice. Trucking employs 1 out of 16 people and is the top job in 29 states in America. Trucking moves 70 percent of the nation’s freight and 56 percent of the gross domestic product. The millions of people who work in the trucking industry are proud of the safety and dependability of their service to America, which first requires a healthy professional behind the wheel. The Kenan Advantage Group is proud to be part of the American Trucking Association – the largest national trade association for the trucking industry, which acts as the voice of the industry America depends on most to move our nation’s freight. The 11 leading ATA members in attendance were: ATA President and CEO Chris Spear, trucking executives: Jim Burg, president and CEO, James Burg Trucking Co., Warren, Mich.; ATA Chairman Kevin Burch, president, Jet Express Inc., Dayton, Ohio; David Congdon, CEO, Old Dominion Freight Line, Thomasville, N.C.; Mike Ducker, president and CEO, FedEx Freight, Memphis, Tenn.; Eric Fuller, CEO, U.S. Xpress Inc., Chattanooga, Tenn.; Neal Kedzie, president, Wisconsin Motor Carriers Association, Madison, Wis.; Rich McArdle, president, UPS Freight, Richmond, Va.; Dennis Nash, CEO, Kenan Advantage Group, North Canton, Ohio; Tonn Ostergard, president and CEO, Crete Carrier Corp., Lincoln, Neb., and John Smith, chairman, CRST International Inc., Cedar Rapids, Iowa.